Hi Fashion (often stylised as Hi-Fashion) are an American electro pop duo, consisting of Jen DM and Rick Gradone. The bands music features electronic, upbeat pop songs, many with ironic and humorous lyrics. DM and Gradone are both originally from New York but both are now based in Los Angeles. Currently, Hi Fashion has released one EP, their debut, Sprechen Sie Hi Fashion? Gradone and DM met in a gay bar in New York city where he flirted with DM, thinking she was a man. After this, the pair became friends and DM invited Gradone to a benefit concert, where she was performing. Hearing DM sing, Gradone invited DM to form a band together, which she refused. Gradone then sent DM three tracks to listen to and asked again if she would work with him. DM had plans to start an all-woman metal band but agreed to join with Gradone, and thus Hi Fashion was formed. Originally, the pair named the band Hi-Fashion $5.99 and later changed it to Hi-Fashion $9.99 and eventually dropped the price tag and became known simply as Hi-Fashion. 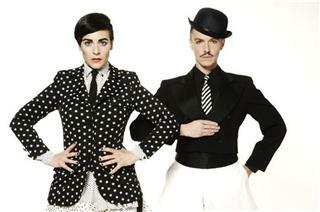 Hi Fashions first single, Amazing was released in July 2010, and their debut EP Sprechen Sie Hi Fashion? a year later, in July 2011. Since the release of said EP, Hi Fashion have released several singles on to iTunes with music videos to accompany them via YouTube. A second EP by the duo was announced in April 2013, to be titled "You Are Gorgeous". The band, fronted by DM, ensued to raise the funds needed to support and produce the album by use of KickStarter, where they successfully raised over $25,000. The album was released in July of that year. The bands style is most noted in their music videos for their singles, demonstrating a lavish and outlandish fashion style, also strongly mirrored in their live performances. Many of the clothing items are made by the band themselves.